We concluded the last section with an observation of Ellis Rivkin: “We must, therefore, conclude that the Aaronides come to power with the finalized Pentateuch and, as such, are their own creation” (IDB). The priestly Aaronides, centered in Jerusalem, are the post-exilic religious hegemonists who took authority away from the pre- and concurrently-existing (gnostic) Levites. By “their own creation,” Rivkin means that the Aaronides invented their own pedigree, invented their status as Levites (for Aaron was supposedly himself a Levite), and in this way they took over from the ancient and ʻtrueʼ Levites the rights to administer the Temple. Essentially, they arrogated to themselves the religion which became known as “Judaism.” With the rise of the Aaronides and the eclipse of the Levites, the old religion of Yahweh-gnosis became a religious of Yahweh worship. We recall that the First Temple of Solomon possessed an abzu—it was clearly a temple devoted to gnosis. But the Second Temple was emphatically devoted to the worship of Yahweh. In any case, archaeology has failed to find evidence of Solomon’s temple at all, showing that the language of Jewish scripture is largely metaphorical. David and Solomon themselves appear to have been mythical figures. This accounting of history will no doubt be unfamiliar to the reader, even strange. After all, we read in the Jewish scriptures how the Levites are consistently subordinated to the “priests” (Num 3:6; 8:19; 18:2), how they cannot carry out the most important duties of the Temple, how they are landless, and how their tithes (i.e., their very livelihood) are but a fraction of the tithes first given the priests (Num 18:24, 30). This change in Levitical fortunes reflects a remarkable about-face which occurred at an early stage in Judaism. However, unmistakable signs of the older religion survive in Jewish scripture, i.e., the Brazen Sea—a huge cauldron of water symbolizing gnosis (the Mesopotamian abzu) described in the Temple of Solomon (1 Kgs 7:23 f). This doubtless reflects the original pre-Aaronide religion of Israel—the religion of the Levites, “first born” to Yahweh (Num 3:12-13). A prior post in this series describes how a Levite from Bethlehem goes northwards to Dan with accursed silver. This is an Aaronide story, at once pejorative of Bethlehem, of the Levites, and of Dan. The Aaronides could not exclude the non-Jerusalem based Levites from the cult—for Levi was one of the twelve sons of Jacob, and his descendants had already long been in the land carrying out priestly functions. But they could, and did, write a ‘new rule’ severely subordinating the Levites and excluding them from henceforth from approaching “to offer incense before Yahweh” (Num 16:40). It would appear, from our inferences, that the non-Jerusalem Levites were indeed Hebrews, but gnostic-leaning Hebrews. We can also speculate that gnosticism became ʻhereticalʼ with the ascendancy of a highly centralized priestly caste—the Aaronides—probably at first no more than a family. It would appear that the Aaronides conceived of their hegemony over the Israelite religion while in captivity in Babylon. It would have been there and then that they formulated the new recension of the Torah. The return to Jerusalem in the late sixth century was a religious re-conquest attended not only by the building of a new temple but also by new scriptures. Henceforth, the non-Jerusalem Levites were essentially outsiders to power. They constituted a vestige of the original Hebrew religion, of the religion of Moses, of North Arabia—and of Dan. (For more on these aspects see the tab above, “B.C.E. times”). In post-exilic times the Levites carried on the torch of proto-gnosticism in more or less heterodox and ʻhiddenʼ traditions, represented by a number of writings in the Jewish pseudepigrapha (particularly the Enoch literature). That literature powerfully informed Christianity, including its anti-Jerusalem and anti-cultic aspects (cf. Mk 11:15-19; 7:6, 15, etc). According to this scenario, the decentralized and landless Levites represented a heterodox Judaism vilified at every turn by the ʻnormativeʼ Jerusalem-bound Aaronides. The Korah episode illustrates the virulent Aaronide animosity directed at the older religion. 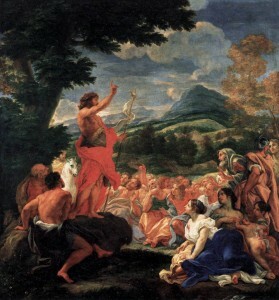 Korah, of Levitical descent and supported by other Levites, dared to challenge his subordination to the Aaronides and demanded full priestly status. The Priestly writer fashions his story (Num 16) in such a way that a divine sign determines who will be allowed to approach Yahweh—i.e., who will control the Temple and take pre-eminence in Israel. The divine sign is not long in coming. 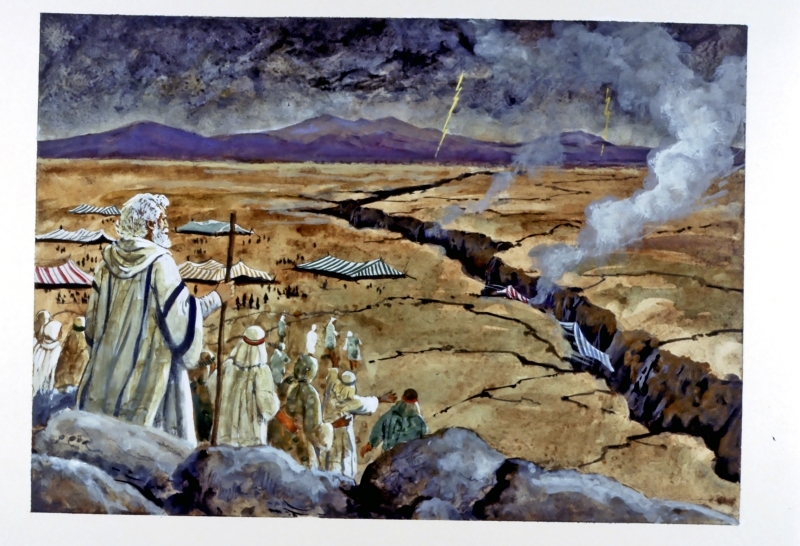 The ground opens up and swallows Korah and his levitical allies, together with their wives and children, “and all these went down alive to Sheol; the earth closed over them, and they perished from the midst of the assembly” (Num 16:32-33). The purpose of the story is then stated: “a reminder to the Israelites that no outsider, who is not of the descendants of Aaron, shall approach to offer incense before Yahweh” (v. 40). It was no longer sufficient to be merely a Levite—one had to be a descendent of Aaron. Thus, insiders and outsiders exchanged places. The latecomers, the Aaronides (whose Levitical pedigree was possibly fabricated), now defined themselves as insiders; while the rest of the long-standing Levites who had worked among the people for centuries became outsiders. Henceforth, the priestly family of Jerusalem Aaronides wielded unchallenged authority within the clan of Levi and over the Temple (Num 17:1-13). Until the rise of the Pharisees, they guided Israelite religion. In the earliest Christian gospel that received canonical status, the Gospel of Mark, Jesus is known as a Nazarenos. Subsequently, however, “Jesus the Nazarene” was replaced by “Jesus of Nazareth” and, thus, the term “Nazarene” became an enigmatic term. To recover its meaning is to recover the true origins of Christianity. Subsequent gospels replace “Nazarene” with “Nazareth”—a place, a toponym, a village not yet even in existence when the Gospel of Mark was written. It is clear, however, that Mark knew the original meaning Nazarene (“keeper of hidden wisdom”)—but he betrays that meaning by making his Jesus a miracle worker, one who heals not by gnosis but by the magic power of God and by faith (1:25; 5:36, etc). Subsequent Christian writings took the Marcan solution several steps further by giving “Jesus” a fully transcendent origin (virgin birth) and goal (bodily resurrection and eschatological judgment). Already with Mark, however, faith in Jesus has replaced gnosis—knowledge of life (in Mandean, Manda d’Hayye). In view of the above, to understand Christian origins we must return to the original word “Nazarene” and inquire into its meaning. Behind the Greek word doubtless lies the Semitic root n-ts-r, discussed in a prior post. That very ancient root—going back even to the third millennium BCE—betrays several meanings, including the possession of secret wisdom, and the ability to ʻcross overʼ from ignorance to gnosis. 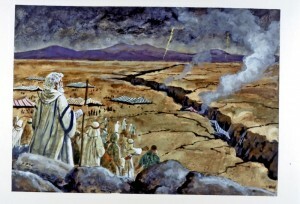 That crossing over is preserved in monumental literary stories including the Flood, the crossing of the Red Sea, and the crossing of the Jordan River to the Promised Land. Underneath all these iconic stories is a deep gnostic message—crossing over from ignorance to gnosis. However, in each case that original message has been lost as the story became concretized: today we read about crossing various bodies of water (having quite forgotten that “water” was a symbol of gnosis). The metaphor became fact, the symbol became real —and, in the process, truth was lost. In ancient gnostic religion man merely crosses over the sea, as does Atrahisis/Noah. In the subsequent anti-gnostic Jewish religion, however, the Aaronides metaphorically asserted dominion over gnosis by making the waters “roll” back. We see this “rolling back” of the waters in the crossings by the Israelites of both the Nile and the Jordan. In this way the Aaronides symbolically asserted Yahweh’s victory over the religion of gnosis. But for the gnostic, water was a positive symbol. It not only symbolizes gnosis, but also the elements leading to gnosis. Those elements include watchfulness (natsar), that is, being awake when others are asleep. This is another way of metaphorically “going against the stream”—as did the fishes in so many Babylonian depictions of the god Enki. The Gospel of Mark particularly enjoins ʻwatchfulness,ʼ as we read in the famous scene in the Garden of Gethsemane (14:32 ff). Jesus exhorts the disciples to “remain here, and watch” (γρηγορεῖτε) while he prays. The disciples are unable to do so and fall “asleep.” Mark also writes: “Watch therefore—for you do not know when the master of the house will come, in the evening, or at midnight, or at cockcrow, or in the morning—lest he come suddenly [ἐξαίφνης] and find you asleep” (Mk 13:35–36). The association of the Flood with divine retribution can be no coincidence. It shows that to ancient Sumerians and early Christians alike, sudden and devastating divine retribution was the lot of those who failed to be watchful, natsar. The key is knowledge into the ways of the divine—gnosis. By being watchful, the wise person avoids ruin and the action of the divine does not catch him off guard. But the ultimate value of watchfulness is not self-preservation. That too, is a metaphor. Being watchful, the wise person has saving insight unknown and unseen by his peers. They die but he does not. The deluge is not material but metaphorical—it is the deluge of ignorance which drowns all except the Natsarene. Noah was prepared. He had foreknowledge. The New Testament relates that one is to metaphorically prepare for the divine visitation precisely where and when one least expects—as did the wise maidens at midnight (Mt 25:1 ff). In other words, watchfulness is the key to knowledge and understanding of that which is hidden. In late antiquity, the mantle of gnosticism passed to the Natsraiia (Mandeans) and to the Natsarenes (pre-Christians). Their names betray the Semitic root that, already for millennia, had been associated with a preparedness and hidden knowledge that saves. 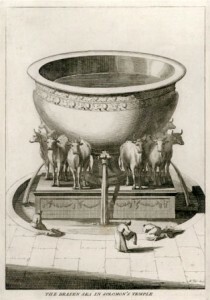 For gnostics, water was also a sacred symbol of gnosis. In antiquity gnostics belonged to baptist sects. They frequently immersed in water to memorialize and re-enact their central sacrament, the attainment of gnosis (ʻenlightenmentʼ). 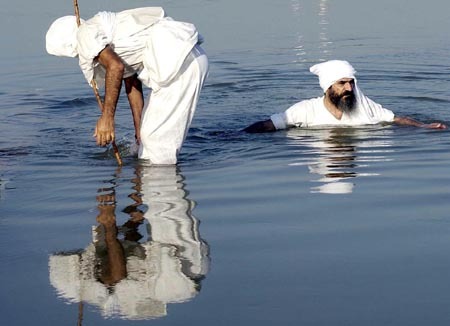 The Mandeans venerate John “the Baptizer,” a gnostic figure who dipped others in water—that is, he metaphorically introduced them to the way of gnosis. Using the metaphors we have touched on in this series of posts, Johnʼs teaching came from gnosis (water), out of Bethlehem (the gate to gnosis), and from Ephrathah (the land of salvation)—even as his ancient namesake, Oannes, the half-fish half-man of Mesopotamian legend, emerged from the sea to teach the Sumerians wisdom more than two millennia earlier (according to the Babyloniaca of Berossus, the Mesopotamian priest of the third century BCE). This language is unfamiliar to Christians today. It is the language of gnosticism, a metaphorical language replete with so much symbolism that it resembles a code. This language is clearly visible in gnostic tracts such as those discovered at Nag Hammadi. It is also visible in the Christian canon itself. Gnosticism has been obscured—but it has not been eradicated. John preached a hopeful and revolutionary message: that salvation (Yeshua, “Jesus”) is now and always at hand, readily available to every person through watchfulness and through the seeking of inner gnosis. This is the hidden knowledge, the nitsirtu known already in Mesopotamian religion two millennia earlier. It is interesting that in the thoroughly suppressed Acts of Mark (still unpublished, but now available in part on this site), we read that Mark is a Levite and a disciple of John the Baptist. This and many other signs tell us that the gnostic Levite, John “the Baptist,” is the quintessential Natsarene who, though obscured by Jesus “of Nazareth,” stands like a beacon at the very foundation of the Christian religion.